Customizable to suit your needs. scroll wheel allows you to navigate through files on your PC, while the dustproof optical trackball offers unparalleled navigation accuracy. 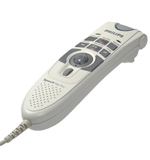 Conveniently control the playback volume directly on the SpeechMike. Excellent sound quality ensures crystalclear playback, saving time during the transcription process.